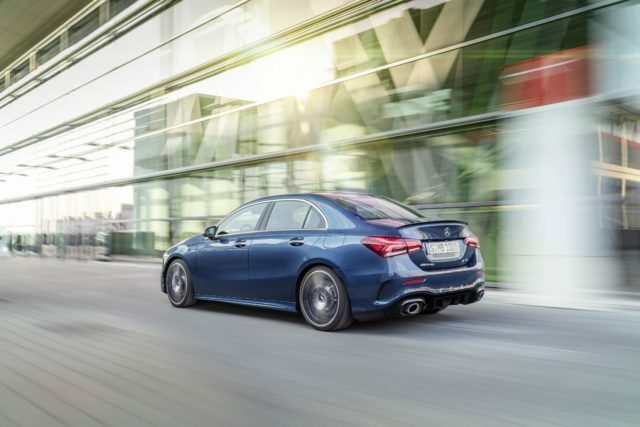 Called the A 35 4Matic saloon, the car can deliver the same performance as its five-door stablemate, but with added practicality. Fitted with a turbocharged 2.0-litre engine, it’ll go from 0-60mph in just 4.6 seconds and top out at a limited 155mph. Power is sent to the wheels via a seven-speed dual-clutch automatic transmission. Mercedes-AMG claims that it’ll return up to 39.2mpg combined, and emit as low as 164g/km CO2. Tobias Moers, CEO of Mercedes-AMG. Said “Following the very successful launch of the hatchback model, things are moving along dynamically in the compact class segment at AMG. “Sport saloons are the origin of Mercedes-AMG and part of the brand’s core. With our new A 35, we are transporting this history into modern times in the form of a very attractive model that serves as a point of entry into the world of AMG and also appeals to new customer groups”. Inside, sports seats have been fitted along with a new AMG sports steering wheel, which features an LCD display – recently seen on the updated C 63. Behind the steering wheel is one part of Mercedes’ MBUX multimedia system, which combines a large central screen and another, smaller display in the place of the conventional dials. The latter can be tailored to the drivers’ preference, allowing for different displays and readouts to be displayed. No prices for the new A35 saloon have been revealed at yet, nor a date for when it will go on sale — but expect it to arrive in showrooms in the latter half of 2019.